THE WAVE – International trailer. THE WAVE is an epic Scandinavian disaster movie based on true events. The film will be directed by Norwegian director Roar Uthaug (COLD PREY, 2006 and ESCAPE, 2012) and produced by Norwegian company FanteFilm Fiksjon who in current years has established themselves as the production company of large scale Scandinavian genre films. Directed by Roar Uthaug is based on real predictions of a natural disaster, based on events from 80 years ago when a number of villages in Norway were hit by a huge tsunami after a mountainside collapsed in the fjords. Geologists say that it is just a matter of time before it happens again. Starring Kristoffer Joner and Ane Dahl Torp, The Wave begins just prior to the incident in the present day and focuses on an experienced geologist who has less than 10 minutes to react when the alarm goes off. 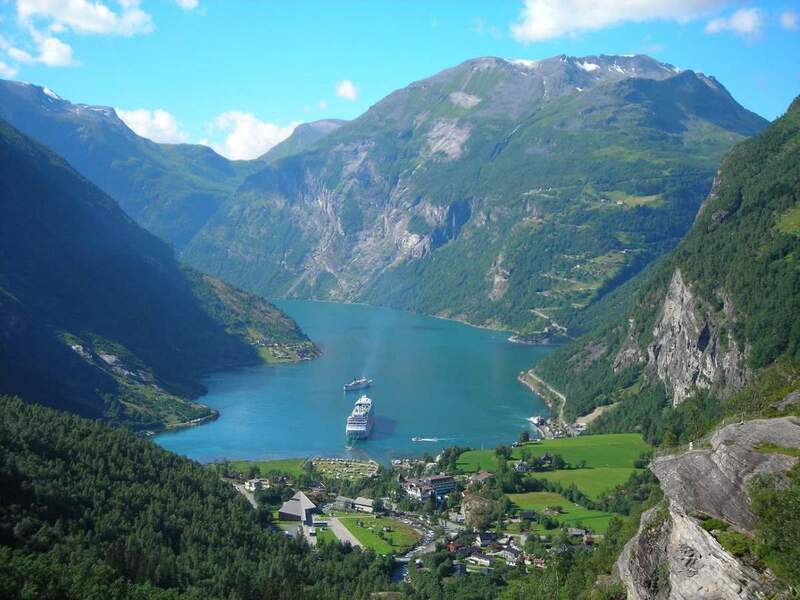 The film is not completely fictional, in fact, Geiranger could be wiped out any second in real life. Norway is a rockslide prone area and this has happened before, more than once: The Wave is based on a rock-slide tsunami (which is called megatsunami) that washed over the villages of Fjørå and Tafjord in Møre og Romsdal on 7 April 1934. Over forty people died. Prior to that in 1905, a similar incident again triggered a megatsunami killing 60 people, and 31 years later, another 74 lost their lives. Megatsunamis have quite different features from tsunamis. Most ordinary tsunamis are caused by underwater tectonic activity: an earthquake occurs, the sea floor rise and fall, causing a massive amount of water to be displaced. Tsunamis have a small amplitude (wave height) offshore, and a very long wavelength (often hundreds of kilometers long, whereas normal ocean waves have a wavelength of only 30 or 40 meters), which is why they generally pass unnoticed at sea, forming only a slight swell usually about 30 centimeters (12 in) above the normal sea surface. As the tsunami approaches the coast and the waters become shallow, wave shoaling compresses the wave and its speed decreases below 80 kilometers per hour (50 mph). Its wavelength diminishes to less than 20 kilometers (12 mi) and its amplitude grows enormously. The water piles up to a wave height of up to about 10 meters/33 feet. Propagation of a tsunami offshore, showing the variation of wavelength and amplitude as a function of depth. Author: Régis Lachaume, Wikipedia. By contrast, megatsunamis can occur in locations where there is a very large amount of material that suddenly falls into water (landslide), or anywhere in water (for meteor impact), or may be caused by volcanic activity, and can have extremely high initial wave heights of hundreds and possibly thousands of meters, far beyond any ordinary tsunami, as the water is “splashed” upwards and outwards by the impact or displacement. As a result, two heights are sometimes quoted for megatsunamis – the height of the wave itself (in water), and the height to which it surges when it reaches land, which depending upon the locale, can be several times larger. Now we know that a number of megatsunamis occurred in prehistoric, historic and modern ages. For instance, approximately 66 million years ago, the asteroid which created the Chicxulub crater in Yucatán (scientists believe that this impact is the main cause of the extinction of numerous animal and plant groups, including non-avian dinosaurs) caused some of the largest megatsunamis in Earth’s history: the waves should be as high as 5 kilometers (3.1 mi) and would have reached all the way to Texas and Florida. About 2.5 million years ago, another asteroid impact in the southeast Pacific Ocean caused a megatsunami that was over 200 m (660 ft) high in southern Chile and the Antarctic Peninsula; the wave swept across much of the Pacific Ocean. In the more recent times, some 3,600 years ago, the Minoan eruption (sometimes called the Thera eruption), which occurred at the height of the Minoan civilization (an Aegean Bronze Age civilization that arose on the island of Crete and other Aegean islands such as Santorini and flourished from approximately 3650 to 1400 B.C.). The eruption left a large caldera surrounded by volcanic ash deposits hundreds of meters deep and may have led indirectly to the collapse of the Minoan civilization on the island of Crete, 110 km (68 mi) to the south, through a gigantic megatsunami. Another popular theory holds that the Thera eruption is the source of the legend of Atlantis. In 1792, Mount Unzen in Japan erupted, causing part of the volcano to collapse into the sea. The landslide caused a megatsunami that reached 100 meters (330 ft) high and killed approximately 15,000 people in the local fishing villages. In 1883, The eruption of Krakatoa created pyroclastic flows which generated megatsunamis when they hit the waters of the Sunda Strait on 27 August 1883. The waves reached heights of up to 24 meters (79 feet) along the south coast of Sumatra and up to 42 meters (138 feet) along the west coast of Java. The explosions heard also remain the loudest noise on human record. The sound was heard across the Indian Ocean, as far away as Rodriguez Island, 4,653 kilometers to the west, and Australia, 3,450 kilometers to the east. On July 9, 1958, a giant landslide at the head of Lituya Bay in Alaska, caused by an earthquake, generated a wave with an initial amplitude of up to 520 meters (1,710 ft). This is the highest wave ever recorded, and surged over the headland opposite, stripping trees and soil down to bedrock, and surged along the fjord which forms Lituya Bay, destroying a fishing boat anchored there and killing two people. Howard Ulrich and his son managed to ride the wave in their boat, and both survived. Alaskan Super Wave – Mega Tsunami – BBC. Two survivors of a Mega Tsunami tell their stories of the day the half-a-kilometer high wave hit Lituya Bay. On October 9, 1963, a landslide above Vajont Dam in Italy produced a 250 m (820 ft) surge that overtopped the dam and destroyed the villages of Longarone, Pirago, Rivalta, Villanova and Faè, killing nearly 2,000 people. On May 18, 1980, the upper 460 meters (1,509 feet) of Mount St. Helens collapsed, creating a massive landslide. This released the pressure on the magma trapped beneath the summit bulge which exploded as a lateral blast, which then released the over-pressure on the magma chamber and resulted in a plinian eruption. One lobe of the avalanche surged onto Spirit Lake, causing a megatsunami which pushed the lake waters in a series of surges, which reached a maximum height of 260 meters (853 feet) above the pre-eruption water level (~975 m asl/3,199 ft). Above the upper limit of the tsunami, trees lie where they were knocked down by the pyroclastic surge; below the limit, the fallen trees and the surge deposits were removed by the megatsunami and deposited in Spirit Lake. Previous PostNASA Releases 360 Degrees Interactive Image of MarsNext PostDrone Footage Of The Himalayas, in HD!